Ok as most folks here know I am a rpm speed freak! Scary as the TD is rated for 25k static it has been well exceeded. 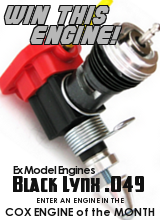 9.17oz thrust / .184hp / 137.3w / 120mph pitch speed! 9.2" MRP (mean reflective point) 30% nitro / 20% castor / no pressure tap. 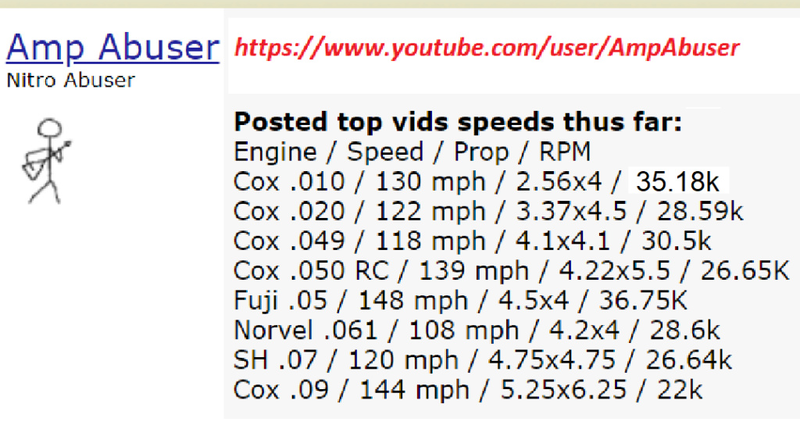 + 2,907 rpm improvement over the first effort see video below. more rpm on the top end. Note the Lil speedy hit 31k unloaded at 118 mph with a 4P prop. I will tame it down with a 4.2x5.5 prop at 28-30k unloaded 146-156 mph. The 4x4.5 was just to stage on the pipe for bench testing. The above vid used a pressure tap. What I am currently using took quite a bit to mod for use. The yellow rubber band was to insure I had a good seal / didn't want to use a zip tie for this test. 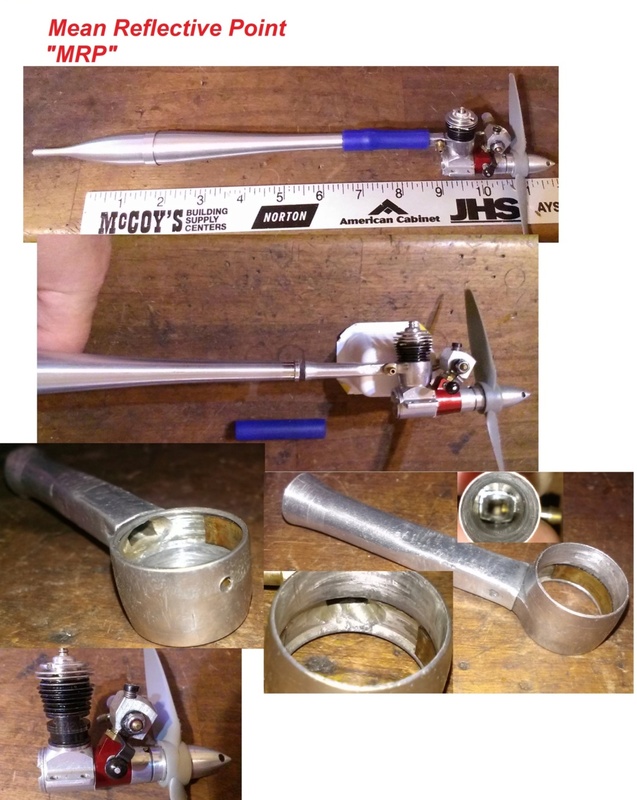 reduce to an over all size span of 25" Made just for the engine used in the bench test. With speed, the sound follows behind the plane neat effect. That sure is some impressive numbers!! I was wondering what kind of wear you see on the crankcase and piston, rod socket after runs like that? And a little more nitro please. 1/2A Nut sure has got it going on in the eyesight and digital dexterity department. Light years ahead of this old slo poke head. What kind of R/C gear is being used here? after 4 different props sizes tested about 18-20 flights in total the socket fit was still good. Nano design will post a vid of it for sure. Need to hit 28.8k rpm which is doable. GOOD LORD! That was fun! I want one! Is that a custom carb body? And I'd like to hear more about the head. Sorry if you've addressed that before. Sign me up for a header if Greg cranks some out. My neighbors will hate me. Kuddos to your reaction time! That's some flying. I had to modify it from a cox car muffler. (See pic) the front exhaust port is blocked off with a brass shim. quite a bit. A good manifold design with a more breathable header will only improve things, I imagine another 800+ rpm static. 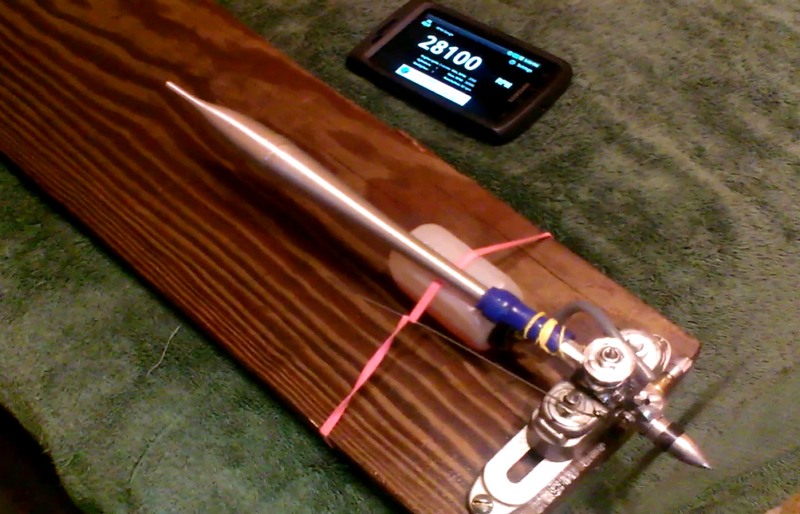 a increase of 2,907 rpm over the first test with a stock high compression plug. The bench test needed the 4x4.5 to get on the pipe. brief bursts of rpm past camera. With the right size plane the prop speed can be used to it's full advantage. average speeds much lower. Wing is 106sq. in. / 31.5" span 11.3oz RTF much bigger bird then the Nano. Congrats Brad!! I am still experimenting with a similar setup. 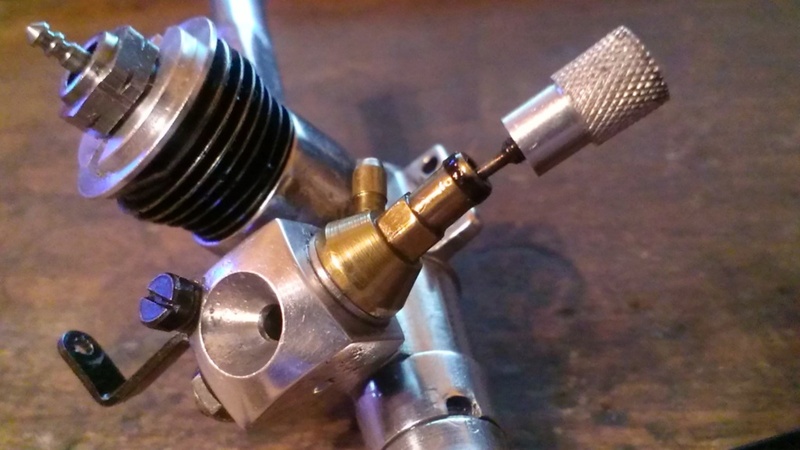 Is your Needle Valve in the Tarno carb a Norvel part? It looks like one but in any way is differentthan my Tarno NV. 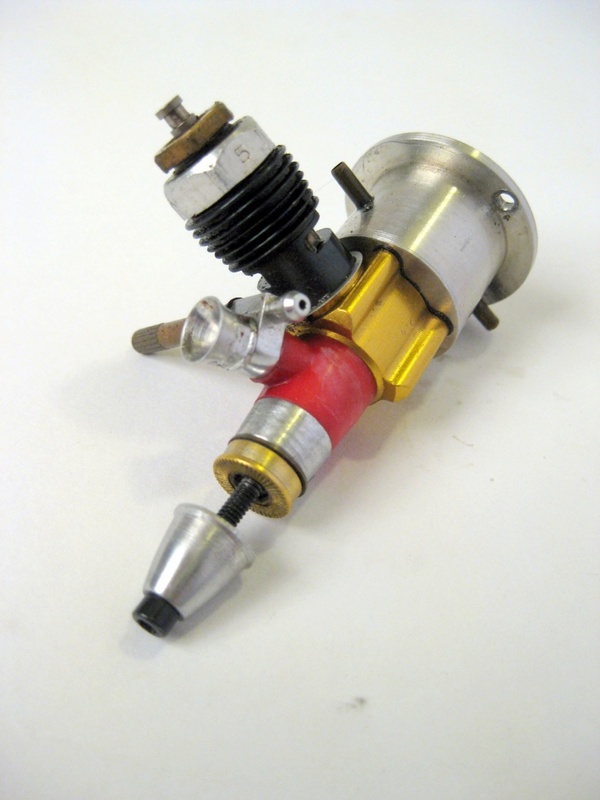 It is the second generation version of the Tarno carb. He may not have the capacity for 1/2A size, my request was for the manifold / header which is in his wheel house. 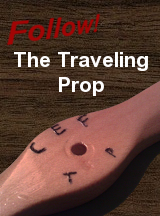 The Profi 1/2A pipe can be bought out of California it is of course shipped into the states from the Ukraine. 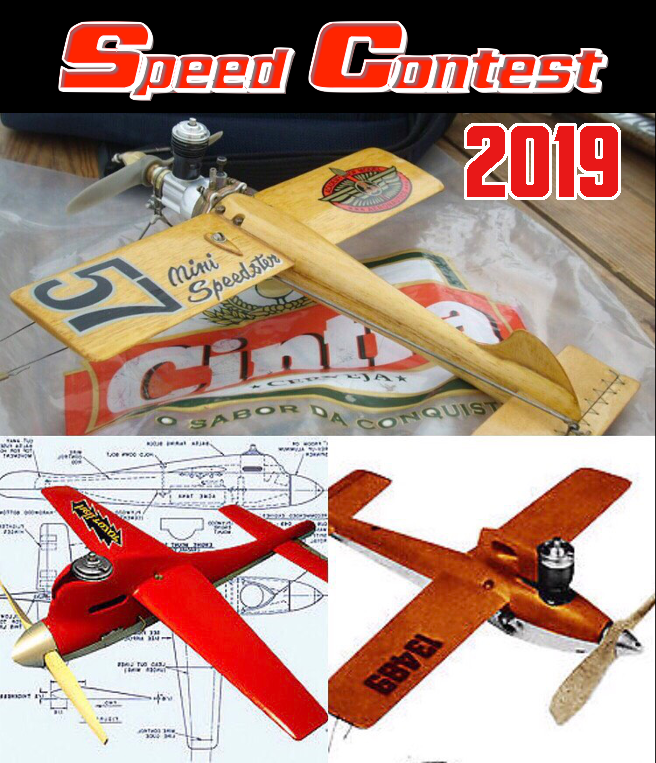 Speeddomingoe on ebay (Alberto) gets them in as I have described before in the past and posted links to his sales page. I have bought 5 of them from him at 65 dollars shipped ea. When they show up they go like hot potato's! Thanks Man , I saved that seller this time LOL I have a few of those Car exhaust manifolds you show a pipe would bee nice ! opened up as I have shown with the tuned pipe. The power loss was about 18% in stock form. Test flight APC 4.75 x 4 / RC carb and car muffler. Launched with some down elevator close call on the save. This vid is more of a trim flight cut short. 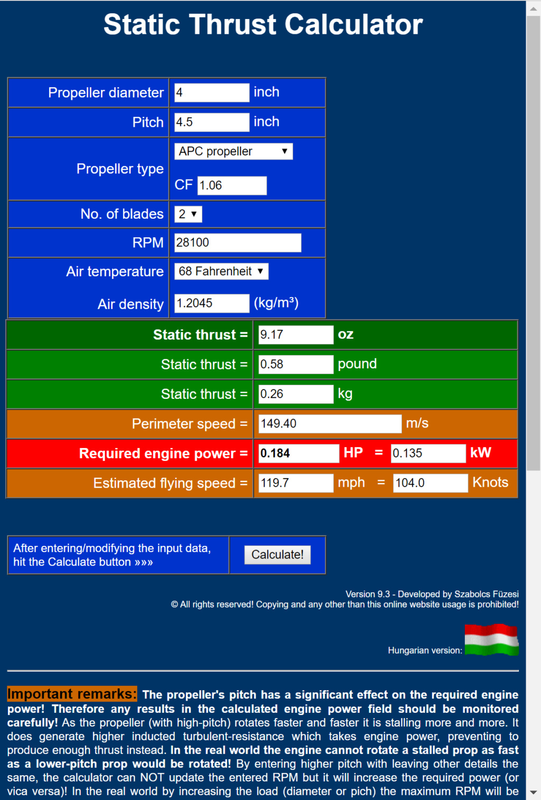 Best pass with muffler 18,476 rpm / 70 mph per prop calc. The plane does about 85 mph without the muffler. Greg is willing make some CNC .049 manifold / headers so folks can add tune pipes, exhaust extensions, mufflers etc. offerings will keep you posted. Fall / Winter time will be more productive for 1/2A offerings. The measurement for the cylinder to slip through needs to be .59" as the cylinder is .58"
Brad is there a way for me to get on any waiting list for 2 of the headers? Yes Fred , just by making mention of it here will allow me to gauge interest and quantities. 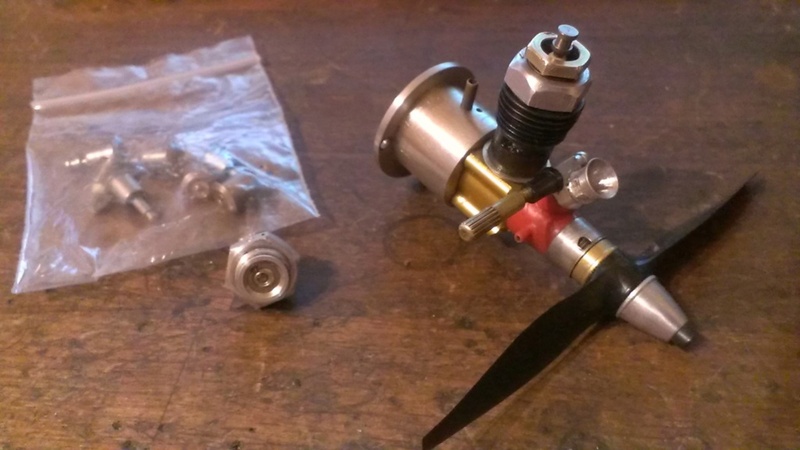 I plan to buy 4 of them myself two for flying, one for bench testing setups leaving one spare. ball rolling for the masses. Always will put the word out we want to help Greg help us. [quote="1/2A Nut"]Ok as most folks here know I am a rpm speed freak! Down to the expert skills of the CNC machinist now. A question for you Brad if you don't mind, how do you go about indexing the cylinder so the exhaust port is directly aft? I thought 25k rpm was the event horizon for the ball socket in the piston. Cross it and bad things happen. Impressive and I hope it holds together. exhaust port your good to go. to do as sport users. 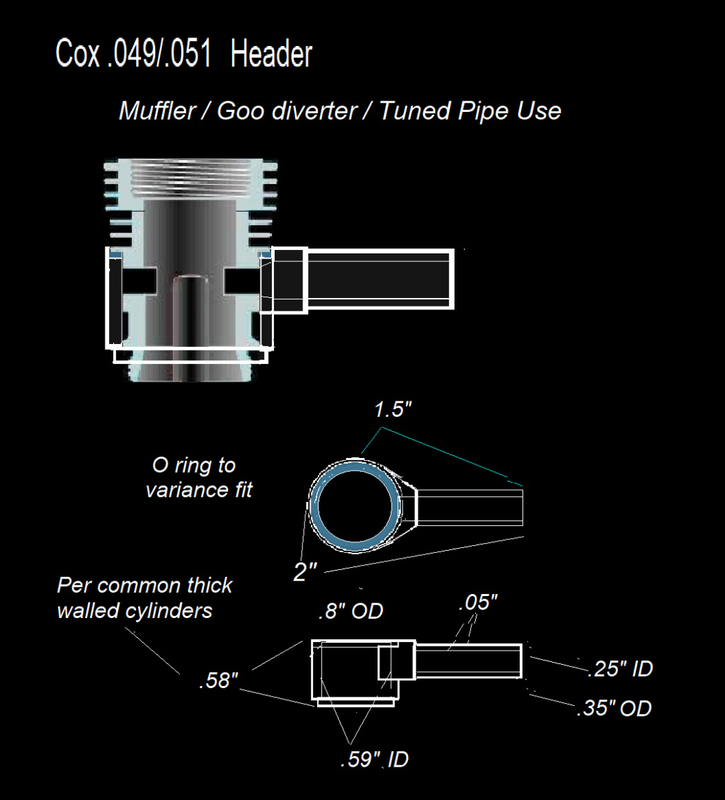 - Aluminum tank top vent tube and overfill micro hole. 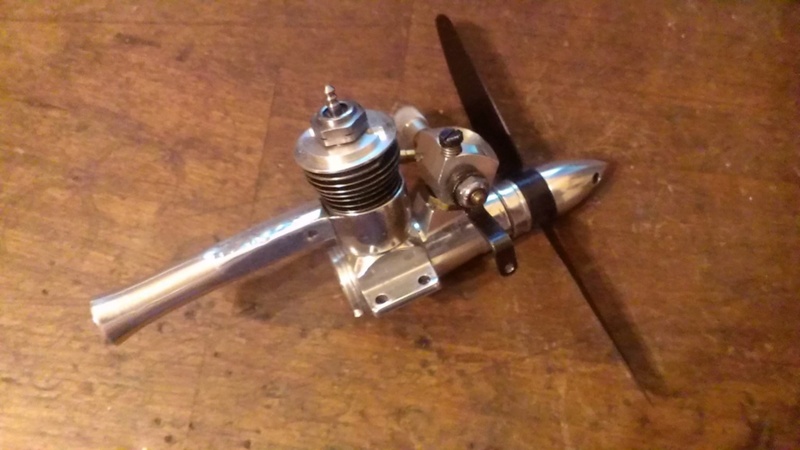 Shown with a 3.75 x 3E prop good for thrust and speed. 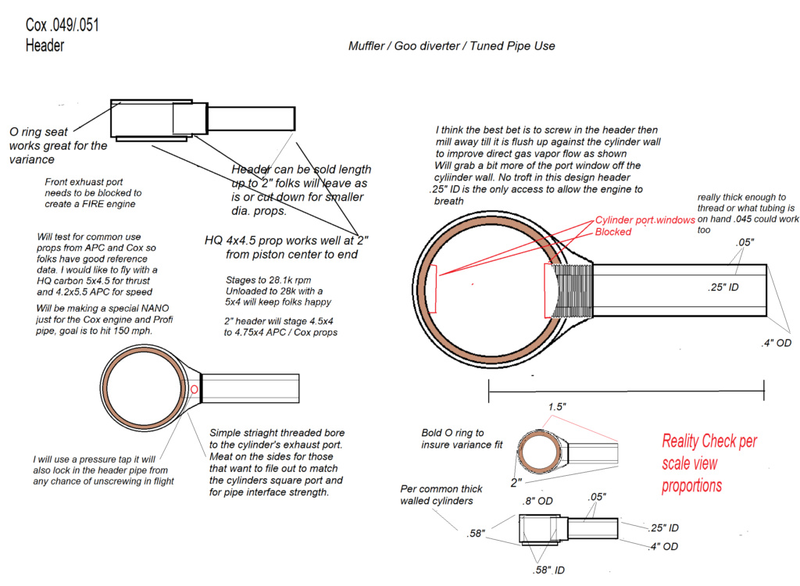 Pipe in if you have some knowledge to share about the origin of the fuel tank etc. Congratulations Brad. 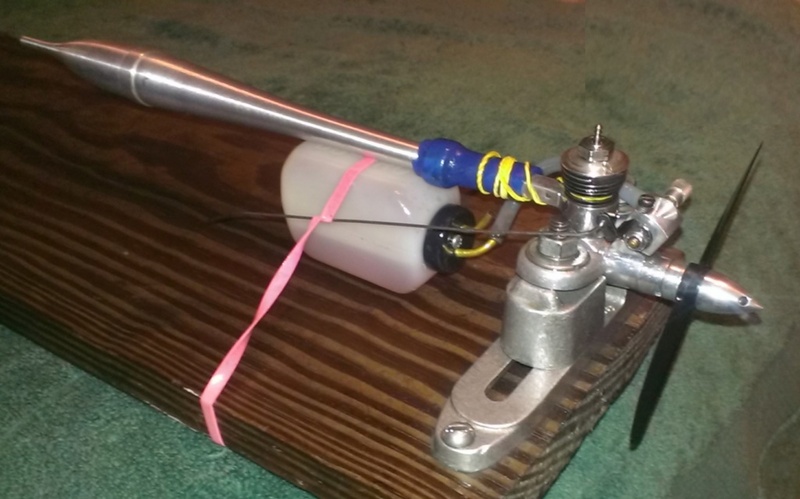 I have followed your experimental-work on hobby-engines and radio-control application. Regarding the "Cox" products.. 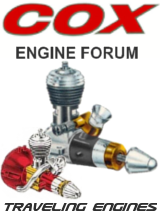 I salute you for the time and dedication that you've invested in obtaining the "absolute-maximum" in performance; especially from the Cox engines. Your performance-videos and documentation are nothing-short of "thrilling" for the enthusiast! Thank You for helping to keep the "Cox" name alive! That's ultimately why we all "tune-in" here! I'd like to second that emotion. I've gone back through searches to some of your posts and videos and I have to say that you are an inspiration. 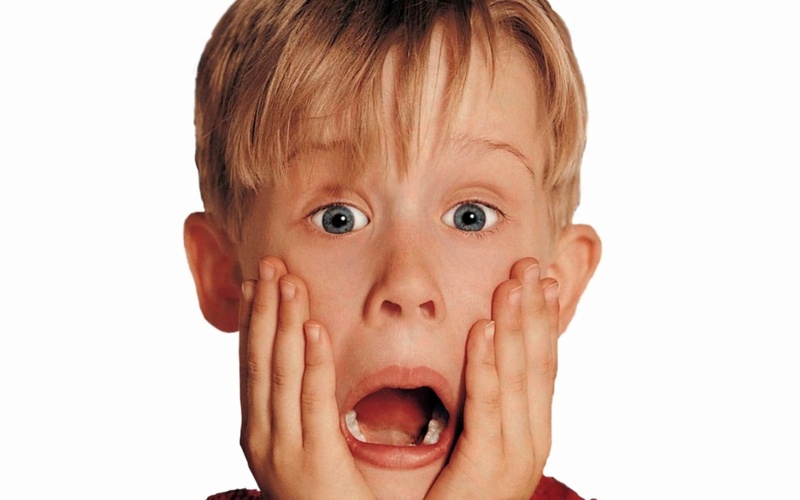 Can't tell you how many times I said "Holy Crap!" Thanks for that! Thank you Roddie and Dave! much appreciated! 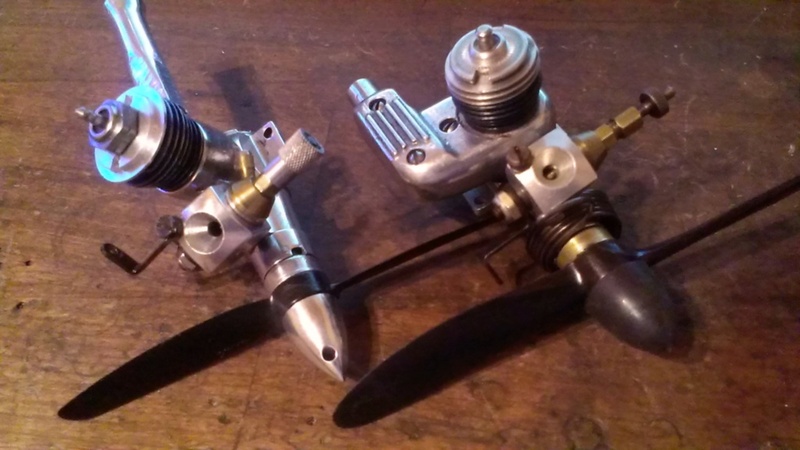 generation of small engine enthusiasts. "Believe it or not, that's at idle." as it zings by at 80 knots.